This traditional handcrafted Thai sculpture will look great in your home or garden. Buddhist hand symbols are often presented in specific styles to represent different aspect of Buddha and Buddhist values. Here Thai Buddhist artisans have crafted and presented a statue that is certain to bring a certain blissful charm to your home. You do not have to be a devout Buddhist to appreciate the beauty. We hope it brings as much Metta into your life as you put into it. Due to the natural origin of handmade and the materials used, please expect 'slight' differences in the color, pattern, shape and finish of the item. We will ship your order within 3 days if the items are available but If we do not have in stock it may take up to 3 weeks to create because these items are original handmade. Please contact us before purchasing if you have a specific date for delivery. Buddha Mudra hand, a "Gesture Of Protection" or "Fearless Mudra" statue. Can be used as a jewelry holder. Feng Shui for home, office or any room. 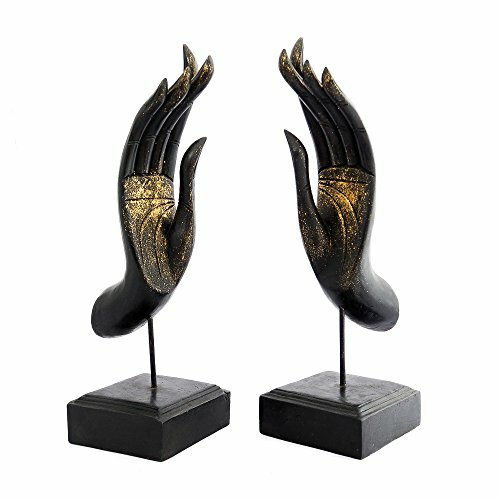 Handmade and hand-painted decorative Buddha Hand by our very own rural Thai artisans with providing fair trade. If you have any questions about this product by Siam Sawadee, contact us by completing and submitting the form below. If you are looking for a specif part number, please include it with your message.